Honeymoon planning is in full swing. Matt and I used $20 of our travel budget to purchase the Lonely Planet Guide to Kaua'i. I was tempted to start planning the trip by plotting everything out on a calendar. But I stopped myself because I don't want to dominate our honeymoon. I want it to be our honeymoon, not my honeymoon. It's hard because I'm so excited. I want to start planning RIGHT NOW. But honestly, I think it's best to slow down and involve Matt in the process. I'm going to ask him if he wants to read through the book with a different color highlighter and circle the stuff he wants to do. Then we can figure out where our preferences overlap and where we might need to compromise. The process will certainly take longer and be more difficult, but it will be better in the end because it will reflect both of us. P.S. Those of you who have been to Kaua'i, please leave your specific recommendations (lodging, food, activities, etc.) in the comments section! You absolutely MUST go snorkling! A million people told us this before we went to hawai'i, and the boy was not keen on it, but I was convinced (although slightly irritated that everyone pushed so hard for it). It was the last thing we did (we were there 10 days, and hit 3 islands), and by FAR, it was the best! Absolutely unforgetable! Also, definitely hit one of the highly-recommended (and more secluded) beaches. I found out after we went that one of the beaches we spent time on was considered one of the best in the world - and I totally see why. Some of the more secluded beaches are also some of the most beautiful, fun, relaxed, breathtaking beaches. Do it! Had I been the planner for our trip, I suspect that my list would have looked much like yours. Oh! And I know that everyone knows this, but REALLY, wear sunscreen. Reapply often. Ignore the fact that you don't feel hot - apply more. We spent a couple of days just recovering after a half day on one of those wonderful beaches (with no reapplication). That is not how you want to spend your time in Hawai'i. Oh! and a helicopter ride! He wanted this badly, and I wasn't sold (especially at the prices! ), but I was completely convinced afterward. It was amazing and breathtaking, and generally wonderful. I love Kauai! Beautiful island. 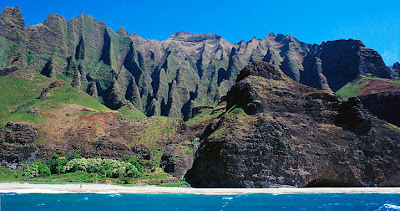 You need to do some form of boat tour by the Na Pali coastline. Sounds like you'd love waimea canyon. The lighthouse is really cool too. Helicopter rides over the na pali coast and/waimea or supposed to be awesome as well. We stayed at Hanalei Bay Resorts (I was with my parents so it may be more than you have $ wise) but we got to stay in condos which was cool because we could save on food a little. Good luck planning! We are thinking of going there to Hawaii as well - one of our 3 options at the moment! I know lots about the other islands as well - feel free to email me with more questions or information (my mom is actually a travel agent who specializes in Hawaii... if you need a travel agent too!). Just got back from our honeymoon in Maui/ Kauai Oct. 25th. I have to say nothing could ever live up to the beauty, peace and laid back attitude. On Kauai I recommend annini beach on the east side for snorkeling or just looking at beautiful turquoise water! And Lydgate State Park for swimming. The north shore is beautiful but remote lots of beaches to choose from. We got to see only 5 out of 10 - 12 we wanted to visit/ b/c they are so gorgeous when you get there you don't want to leave. Try POKE...it's amazing and eat off site of the hotel and road side stands!! We stayed on the south shore and that was sun all the time! Loved it. Oh, I forgot to say check out Queen's bath - gorgeous swimming hole but they say not to go there in the winter b/c of waves...check with the locals before going, it was really gorgeous though, treacherous trail though. very steep wear sneakers. Old Kaloa Town (tom cat cafe) for some fun beachy fare. South shore. Bubba Burger ( fun place lots of attitude) East Side. I have no idea how much this would cost, but my parents went on a plane ride over the big volcano on Kaua'i (it was a little 4-seater plane). I'm amazed that my mom even went, because she's so scared of anything like that, but she loved it. My fiance & i went there as a 'we've finshed grad school" vacation (june '07). The south shore seems sunnier than the north. We rented a cheap condo (there was construction going on so we got a great deal) for the week at Waikomo Stream Villas near Poipu. We could cook if we wanted, and there was a secluded lanai we had breakfast on in the mornings. Splurge on the Na Pali catamaran tour, ususally you get snorkeling & lunch as part of the deal and its amazing (we used Captain Andys). We rented a kayak & paddled up the wailua and had a blast playing around on the rope swing & in the waterfalls on the way. We rented from an outfit located just SE of the bridge over the river on the main highway (Wailua Kayak and Canoe), you don't need a guide for that trip. Also the Kipu Falls rope swing is free & rad. So many beaches have short hikes (like 1/4 mile) to them, that it keeps folks away, like Larsens & Donkey beaches. My fiance and I loved having an amazing beach to ourselves for hours with a little walking. Good eats: Mermaids Cafe, Hamura Saimin. I could go on. Didn't get to see it, but there's a beach called "glass beach" there ... instead of sand, it's all little tiny pieces of sea glass underfoot ... supposed to be amazing. There was also a little waterfall ... I can't for the LIFE of me remember the name right now ... it was in the Lonely Planet guide, I believe, listed as kind of a locals-only place. It's tricky to find, but totally worth it to jump off the top of the waterfall or swing on the rope swing. My husband-elect (aka fiance) and I went in September and stayed at the Jungle Cottage on the north shore (near Hanalei Bay). Here's a link: http://www.vrbo.com/87904. The hosts were so welcoming and wonderful - their house is on the property, but tthe cottage was secluded and just right as a home base for 2 of us. Even has a wonderful outdoor shower! A nice treat if you are camping for some of the nights and don't want to stay in a larger hotel! I just discovered your site! Its been so helpful in planning our low-budget, DIY wedding next summer! My boyfriend (partner, fiance, whatever...) and I went to Hawaii last year and it was AMAZING. We spent a week on the big island, and a week on Kauai. We liked Kauai the best because it was less commercially built up and has such spectacular natural beauty. You can hike Waimea canyon, swim every morning in warm beautiful bright blue waters, and snorkling is super fun. We stayed in a rental house called 17 Palms Cottage (there is a good web site), it was very reasonably priced compared to a hotel, and the decor was simple and nice. There was a bit of noise from the road its off of, which is very busy. But its in a great location, Kapaa town, which lets you travel both the north and southern coast easily. Make sure to eat at the Blossoming Lotus if you like vegi food!